Paignton Zoo staff are cautiously optimistic that they have achieved their first breeding success with a rare primate. The species is the pileated gibbon, classed as Endangered by the International Union for the Conservation of Nature. The baby was born on 19th September several weeks prematurely, and there were fears it might not survive. Mother Shukdi is 9 and was born at Zoo d’Asson, France. Father Hantu is also 9, and came to Paignton Zoo from Zurich Zoo. The pileated gibbon (Hylobates pileatus) is a primate in the gibbon family. The species shows sexual dimorphism - males have black fur while females have pale fur with darker head and belly. Pileated means capped, and refers to the darker cap of fur commonly seen on both sexes. Their call is similar to that of the lar gibbon, but described as “more bubbly”. The pileated gibbon is found in parts of Thailand, Cambodia and Laos. 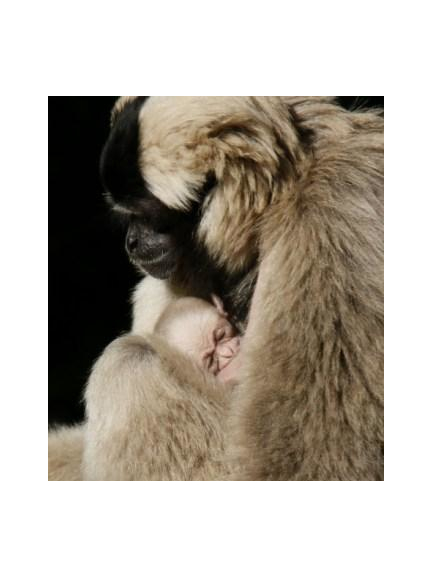 Like other gibbons, the species is diurnal (active during the day) and arboreal (lives in trees). They form monogamous pairs, swing through the trees on their long arms and eat mainly fruit, leaves and small animals. Paignton Zoo Environmental Park is a registered charity. For more information go to www.paigntonzoo.org.uk or ring 01803 697500.